A satisfying ending to a well-written middle grade trilogy, I fully expect to see The Shadow Throne nominated for a Whitney Award for 2014. This will be a short review simply because I want to avoid any spoilers that would lessen your enjoyment of the trilogy, but once again, Nielsen has admirably woven a suspenseful plot with interesting characters to create an engaging read. Perhaps a touch more didactic than the previous books, The Shadow Throne sees Jaron at the absolute limit of his abilities and wits. Imogen has been captured by Avenian forces as the ultimate bargaining chip to force Jaron's surrender, and Mendenwal, another neighboring kingdom, has joined forces with Avenia against Carthya. Just when the odds seem completely insurmountable, seeds planted in The False Prince and The Runaway King come to fruition and a particle of hope appears, but not before Jaron suffers an excruciating loss. 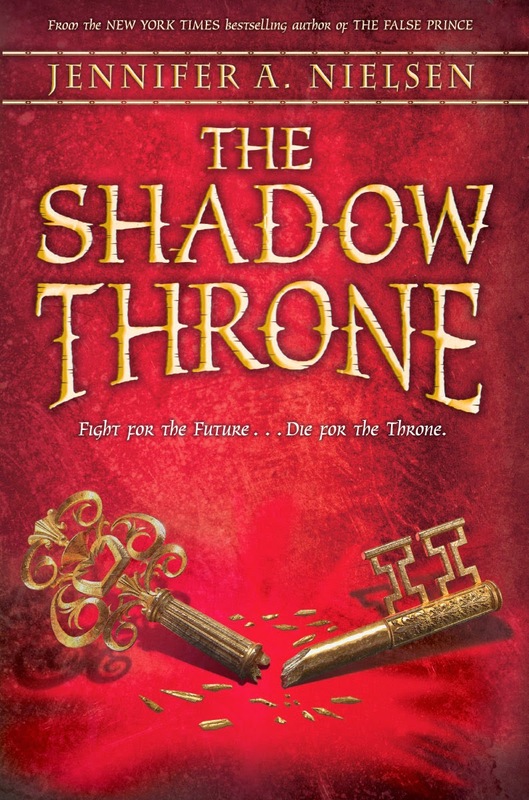 Non-stop action from the first page to the last, but with a strong moral underpinning, The Shadow Throne is a worthy ending to a worthy trilogy. And definitely a candidate for reading aloud to my boys when we're through Lloyd Alexander's Prydain series.